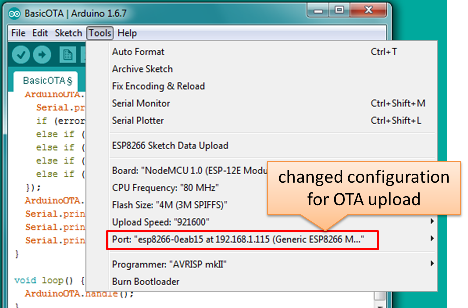 OTA (Over the Air) update is the process of loading the firmware to ESP module using Wi-Fi connection rather than a serial port. Such functionality became extremely useful in case of limited or no physical access to the module. 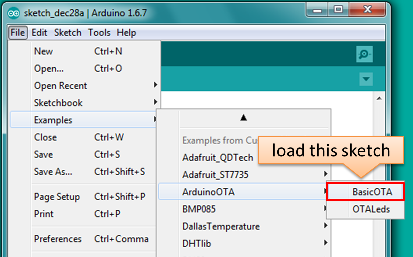 Arduino IDE option is intended primarily for software development phase. The two other options would be more useful after deployment, to provide module with application updates manually with a web browser, or automatically using a http server. In any case, the first firmware upload has to be done over a serial port. If the OTA routines are correctly implemented in a sketch, then all subsequent uploads may be done over the air. There is no imposed security on OTA process from being hacked. It is up to developer to ensure that updates are allowed only from legitimate / trusted sources. Once the update is complete, the module restarts, and the new code is executed. The developer should ensure that the application running on the module is shut down and restarted in a safe manner. Chapters below provide additional information regarding security and safety of OTA process. Module has to be exposed wirelessly to get it updated with a new sketch. That poses chances of module being violently hacked and loaded with some other code. To reduce likelihood of being hacked consider protecting your uploads with a password, selecting certain OTA port, etc. Certain protection functionality is already built in and do not require any additional coding by developer. 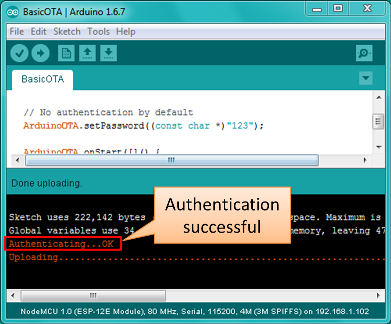 ArduinoOTA and espota.py use Digest-MD5 to authenticate upload. Integrity of transferred data is verified on ESP side using MD5 checksum. Make your own risk analysis and depending on application decide what library functions to implement. If required, consider implementation of other means of protection from being hacked, e.g. exposing module for uploads only according to specific schedule, trigger OTA only be user pressing dedicated “Update” button wired to ESP, etc. OTA process takes ESP’s resources and bandwidth during upload. Then module is restarted and a new sketch executed. Analyse and test how it affects functionality of existing and new sketch. If ESP is placed in remote location and controlling some equipment, you should put additional attention what happens if operation of this equipment is suddenly interrupted by update process. Therefore, decide how to put this equipment into safe state before starting the update. For instance, your module may be controlling a garden watering system in a sequence. If this sequence is not properly shut down and a water valve left open, your garden may be flooded. Flash chip size should be able to hold the old sketch (currently running) and the new sketch (OTA) at the same time. Keep in mind that the File system and EEPROM for example needs space too (one time) see flash layout. can be used for checking the free space for the new sketch. For overview of memory layout, where new sketch is stored and how it is copied during OTA process, see Update process - memory view. The following chapters provide more details and specific methods of doing OTA. Uploading modules wirelessly from Arduino IDE is intended for the following typical scenarios: - during firmware development as a quicker alternative to loading over a serial, - for updating small quantity of modules, - only if modules are available on the same network as the computer with Arduino IDE. The ESP and the computer must be connected to the same network. Instructions below show configuration of OTA on NodeMCU 1.0 (ESP-12E Module) board. You can use any other board assuming that it meets requirements described above. This instruction is valid for all operating systems supported by Arduino IDE. Screen captures have been made on Windows 7 and you may see small differences (like name of serial port), if you are using Linux and MacOS. 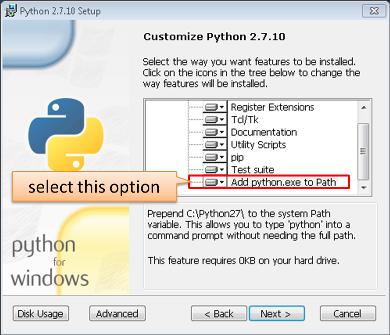 Note: Windows users should select “Add python.exe to Path” (see below – this option is not selected by default). Now prepare the sketch and configuration for the upload over a serial port. Note: Depending on version of platform package and board you have, you may see Upload Using: in the menu above. This option is inactive and it does not matter what you select. It has been left for compatibility with older implementation of OTA and finally removed in platform package version 2.2.0. Note: ESP module should be reset after serial upload. Otherwise subsequent steps will not work. Reset may be done automatically for you after opening serial monitor as visible on the screenshot above. It depends on how you have DTR and RTS wired from USB-Serial converter to the ESP. If reset is not done automatically, then do it by pressing reset button or manually cycling the power. For more details why this should be done please refer to FAQ regarding ESP.restart(). 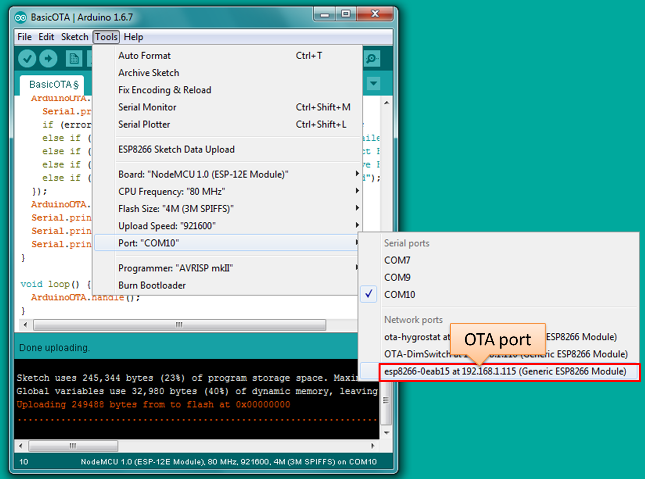 Note: If OTA port does not show up, exit Arduino IDE, open it again and check if port is there. If it does not help, check your firewall and router settings. OTA port is advertised using mDNS service. To check if port is visible by your PC, you can use application like Bonjour Browser. Note: The menu entry Upload Speed: does not matter at this point as it concerns the serial port. Just left it unchanged. Where 123 is a sample password that you should replace with your own. Enter the password and upload should be initiated as usual with the only difference being Authenticating...OK message visible in upload log. You will not be prompted for a reentering the same password next time. Arduino IDE will remember it for you. You will see prompt for password only after reopening IDE, or if you change it in your sketch, upload the sketch and then try to upload it again. Please note, it is possible to reveal password entered previously in Arduino IDE, if IDE has not been closed since last upload. This can be done by enabling Show verbose output during: upload in File > Preferences and attempting to upload the module. The picture above shows that the password is visible in log, as it is passed to espota.py upload script. Another example below shows situation when password is changed between uploads. When uploading, Arduino IDE used previously entered password, so the upload failed and that has been clearly reported by IDE. Only then IDE prompted for a new password. That was entered correctly and second attempt to upload has been successful. This window is for Arduino Yún and not yet implemented for esp8266/Arduino. It shows up because IDE is attempting to open Serial Monitor using network port you have selected for OTA upload. Instead you need an external serial monitor. 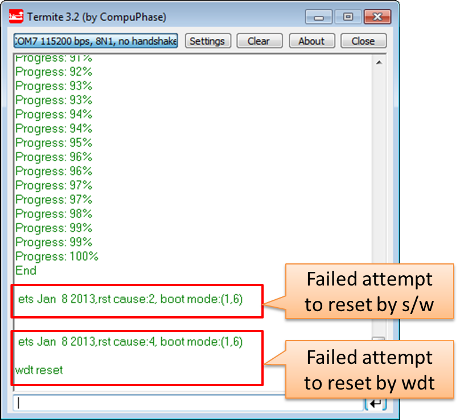 If you are a Windows user check out Termite. This is handy, slick and simple RS232 terminal that does not impose RTS or DTR flow control. Such flow control may cause issues if you are using respective lines to toggle GPIO0 and RESET pins on ESP for upload. If upload fails you will likely see errors caught by the uploader, exception and the stack trace, or both. If this is the case, then most likely ESP module has not been reset after initial upload using serial port. The most common causes of OTA failure are as follows: * not enough physical memory on the chip (e.g. ESP01 with 512K flash memory is not enough for OTA), * too much memory declared for SPIFFS so new sketch will not fit between existing sketch and SPIFFS – see Update process - memory view, * too little memory declared in Arduino IDE for your selected board (i.e. less than physical size), * not resetting the ESP module after initial upload using serial port. For more details regarding flash memory layout please check File system. For overview where new sketch is stored, how it is copied and how memory is organized for the purpose of OTA see Update process - memory view. to provide updates after deployment to small quantity of modules when setting an update server is not practicable. You can use another module if it meets previously described requirements. 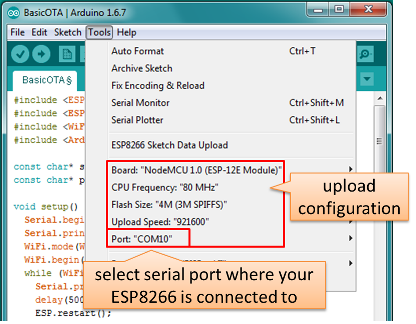 Prepare the sketch and configuration for initial upload with a serial port. Start Arduino IDE and load sketch WebUpdater.ino available under File > Examples > ESP8266HTTPUpdateServer. Update SSID and password in the sketch, so the module can join your Wi-Fi network. Open File > Preferences, look for “Show verbose output during:” and check out “compilation” option. Note: This setting will be required in step 5 below. 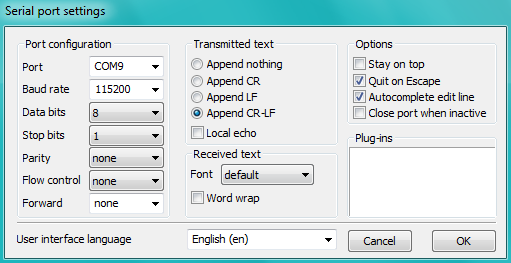 You can uncheck this setting afterwards. Upload sketch (Ctrl+U). Once done, open Serial Monitor (Ctrl+Shift+M) and check if you see the following message displayed, that contains url for OTA update. Note: Such message will be shown only after module successfully joins network and is ready for an OTA upload. 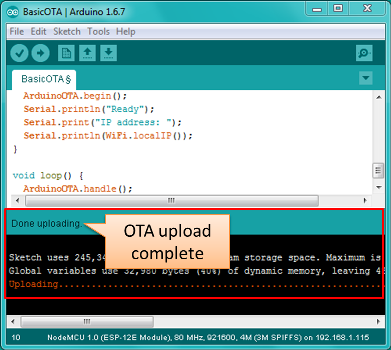 Please remember about resetting the module once after serial upload as discussed in chapter Arduino IDE, step 3. Now open web browser and enter the url provided on Serial Monitor, i.e. http://esp8266-webupdate.local/update. Once entered, browser should display a form like below that has been served by your module. The form invites you to choose a file for update. Note: If entering http://esp8266-webupdate.local/update does not work, try replacing esp8266-webupdate with module’s IP address. For example, if your module IP is 192.168.1.100 then url should be http://192.168.1.100/update. This workaround is useful in case the host software installed in step 1 does not work. If still nothing works and there are no clues on the Serial Monitor, try to diagnose issue by opening provided url in Google Chrome, pressing F12 and checking contents of “Console” and “Network” tabs. Chrome provides some advanced logging on these tabs. To obtain the file, navigate to directory used by Arduino IDE to store results of compilation. You can check the path to this file in compilation log shown in IDE debug window as marked below. Now press “Choose File” in web browser, go to directory identified in step 5 above, find the file “WebUpdater.cpp.bin” and upload it. If upload is successful, you will see “OK” on web browser like below. Just after reboot you should see exactly the same message HTTPUpdateServer ready! Open http:// esp8266-webupdate.local /update in your browser like in step 3. This is because module has been loaded again with the same code – first using serial port, and then using OTA. Once you are comfortable with this procedure, go ahead and modify WebUpdater.ino sketch to print some additional messages, compile it, locate new binary file and upload it using web browser to see entered changes on a Serial Monitor. You can also add OTA routines to your own sketch following guidelines in Implementation Overview above. If this is done correctly, you should be always able to upload new sketch over the previous one using a web browser. In case OTA update fails dead after entering modifications in your sketch, you can always recover module by loading it over a serial port. Then diagnose the issue with sketch using Serial Monitor. Once the issue is fixed try OTA again. ESPhttpUpdate class can check for updates and download a binary file from HTTP web server. It is possible to download updates from every IP or domain address on the network or Internet. Simple updater downloads the file every time the function is called. Its possible to point update function to a script at the server. If version string argument is given, it will be sent to the server. Server side script can use this to check if update should be performed. Server side script can respond as follows: - response code 200, and send the firmware image, - or response code 304 to notify ESP that no update is required. For the simple updater the server only needs to deliver the binary file for update. For advanced update management a script needs to run at the server side, for example a PHP script. At every update request the ESP sends some information in HTTP headers to the server. With this information the script now can check if an update is needed. It is also possible to deliver different binaries based on the MAC address for example. // MD5 hash between local binary and ESP8266 binary do not match if not. // then no update has been found. The Stream Interface is the base for all other update modes like OTA, http Server / client. Updater is in the Core and deals with writing the firmware to the flash, checking its integrity and telling the bootloader to load the new firmware on the next boot. The new sketch will be stored in the space between the old sketch and the spiff. 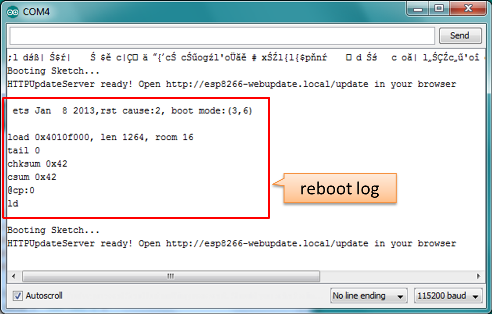 on the next reboot the “eboot” bootloader check for commands. the new sketch is now copied “over” the old one. the new sketch is started. © Copyright 2017, Ivan Grokhotkov. Revision 4ceabea9.